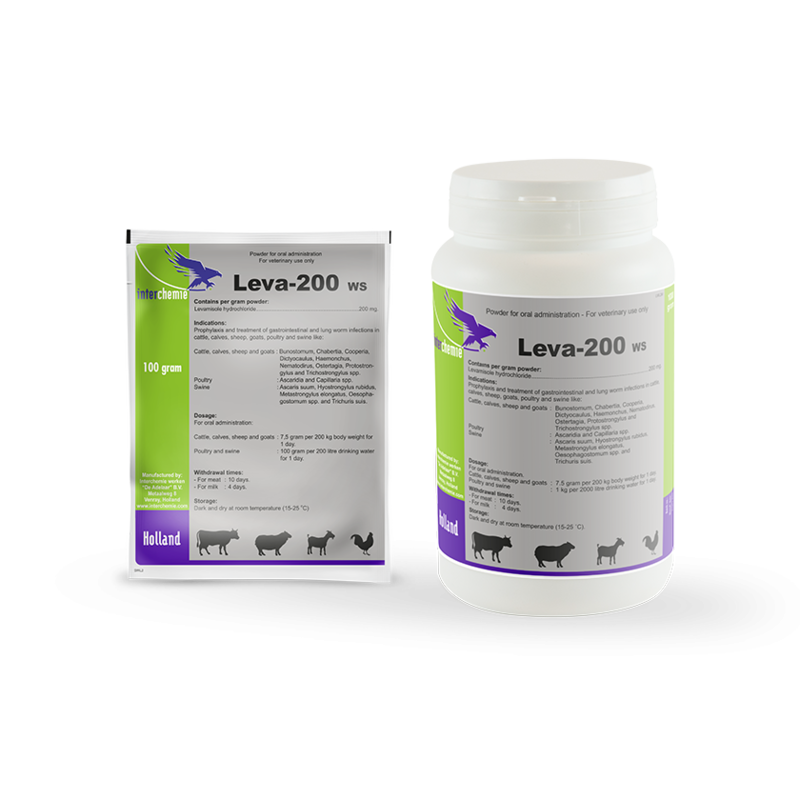 Levamisole is a synthetic anthelmintic with activity against a broad spectrum of gastrointestinal worms and against lung worms. Levamisole causes an increase of the axial muscle tone followed by paralysis of the worms. Bunostomum, Chabertia, Cooperia, Dictyocaulus, Haemonchus, Nematodirus, Ostertagia, Protostrongylus and Trichostrongylus spp. Ascaris suum, Hyostrongylus rubidus, Metastrongylus elongatus, Oesophagostomum spp. and Trichuris suis. Administration to animals with an impaired hepatic function. Concurrent administration of pyrantel, morantel or organo-phosphates. Overdoses can cause colic, coughing, excessive salivation, excitation, hyperpnoea, lachrymation, spasms, sweating and vomiting. 7.5 g per 200 kg body weight for 1 day. 1 kg per 2000 litres of drinking water for 1 day. - For meat : 10 days.